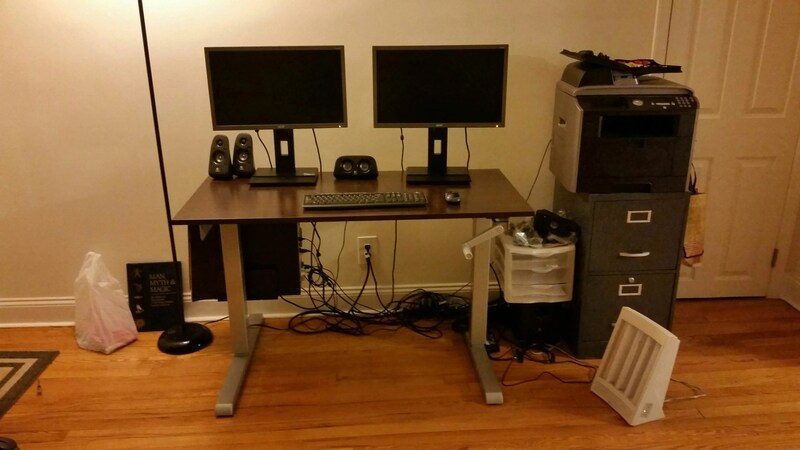 I’ve wanted a height adjustable, sit / stand desk forever. Yes, literally, forever. 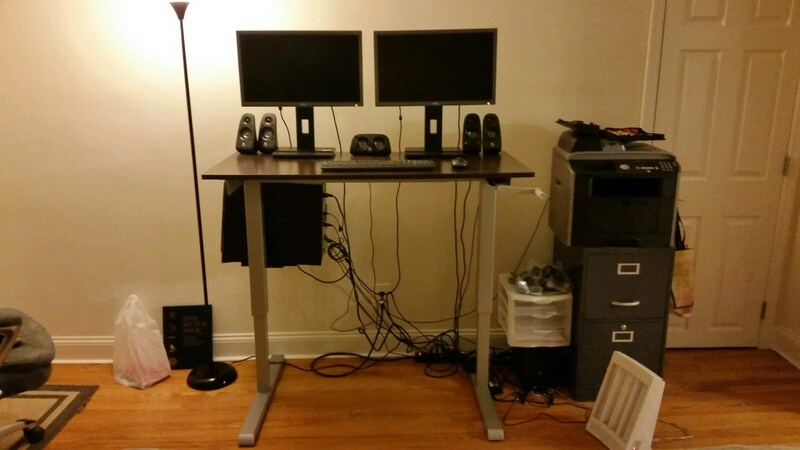 In 2012 I wrote an extensive survey of the sit/stand desk field of products and two years later when I still didn’t have a sit/stand desk I updated and expanded my already extensive survey. Then I never told you about the desk I actually ended up with (thanks to my wonderful wife, Sheila). Well, I’m about to right that wrong. I ended up purchasing a MultiTable ModTable. Yeah, that is a mouthful…and unfortunately, they don’t own the modtable domain, so go to multitable.com. Their prices are about as low as you can go for a real, true height adjustable desk. The reviews I found about the company’s desks were favorable. They offered a hand crank model. Wait, I went with a hand crank model? Yup. I thought about going electric and while it was tempting I decided that a hand crank would probably last me many times longer. This is my ModTable in sitting position. Click on the image to see a much larger image of the same. The hand crank is a simple mechanical mechanism, unlikely to break – whereas electronic components almost always break down eventually. I have hopes that I’ll still be using this desk ten, even twenty years from now. Because I want to be a hobo (of sorts) someday I went with a Medium top (24″ x 48″) so that it could fit into a travel trailer, etc. without too much trouble. I splurged and bought a CPU holder ($100). I initially bought a Belkin keyboard and mouse tray through Amazon, but ran into some trouble getting it to adjust correctly (may have been a broken model or may have been my lack of mechanical skill) and returned it. I’ve planned on getting the keyboard/mouse tray from ModTable but just never got around to it. Even if the Belkin had worked, it would have been a hack job. The metal crossbeam runs under the middle of the desk and most mouse/keyboard trays are made to have their track run vertically and the crossbeam sits firmly astride its desired path. This is my ModTable in standing position. Note that it is still significantly lower than its maximum height [insert short joke here]. I did not buy the monitor arms. They were attractive but I opted instead for monitors that were height adjustable in and of themselves – which have worked out quite nicely. Is the central crossbeam necessary? Could there be a model without it? The manual crank sticks out a bit and is easy to walk into. You can pull it out so that it isn’t in the way, but then you have to put it back in…which is a very minor annoyance, but if there was a way for the handle to fold under the unit, out of the way, that would be amazing. Could it go a little lower? I’m on the vertically challenged end of the spectrum and technically the height of the table top is still a little too high for me ergonomically….if I ever get around to getting the keyboard/mouse tray that will drop it to the correct height, but, still, it’d be nice to go down to say 25 in? If you aren’t planning on living/working in tightly constrained quarters, splurge for the larger top size. Make sure to install the CPU holder far off to the side, otherwise you’ll be kicking it when you are sitting down. Splurge for the CPU holder and the keyboard/mouse tray off the bat. Let me conclude by talking about expense. I’m used to owning used desks or pressed board desks – the kind you can pick up fairly inexpensively from Walmart, Target, or Ikea. ModTable is inexpensive compared to other height adjustable desks, but it is still expensive for those of us who frequent thrift stores for our furniture needs. I heard (I think it was over at Lifehacker) that one should invest one’s money where one spends one time – which makes a lot of sense. Spend money on what you use most in life – a bed, a desk, a car, etc. For me and many like me, a desk is one of those things and the extra expense is worthwhile for our comfort as well as for our health. Next story Now How Do I Use This Old Scanner Again? NAPS2!